A fully featured electronics prototyping workbench in a ruggedized box. This project was built with the purpose of convenience and necessity. 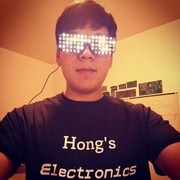 Between school, work, hobbies, and hackathons, the need for test equipment on the go has become more critical. A majority of the hardware I use on a daily basis is open-source and commercial off-the-shelf (COTS). 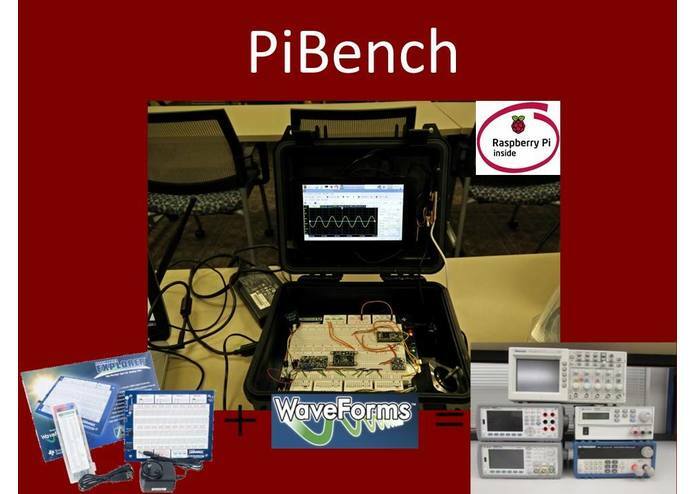 The PiBench is built around the Digilent Electronics Explorer hardware and Waveforms 2015 software, which means that it supports all the same functions and features that are found in the PC, Mac, and Linux versions. "The Digilent Electronics Explorer board (EE board) includes all of the test and measurement equipment needed to design and test analog and digital circuits of all types. Built around a large solderless breadboard, the EE board includes oscilloscopes, waveform generators, power supplies, voltmeters, reference voltage generators, and thirty-two digital signals that can be configured as a logic analyzer, pattern generator, or any one of several static digital I/O devices. All of these instruments can be connected to circuits built on the solderless breadboards using simple jumper wires. The EE board is powered by the free, PC-based WaveForms™ software that makes it easy to acquire, store, analyze, produce and reuse analog and digital signals. WaveForms™ runs well on virtually any notebook PC, including low-cost Netbooks. A high-speed USB2 connection ensures all EE board instruments respond in near real-time. WaveForms™ data files are stored using standard formats, making it easy to share data between instruments, and to export data to word processors or graphics editors. This means well documented lab/project reports can be completed using standard office tools, and submitted electronically." The software, which is officially supported on Mac and Windows, runs on Linux, but is not guaranteed to work and be stable on all distributions. The Pi bench, with some software modifications under the hood, is able to run the software stably in Raspbian Jessie. Software does not run on the Raspberry Pi. Choosing a power supply 5 volts @ 3 Amps and 12 volts @ 2 Amps. By installing a few extra libraries (dependencies) and changing a few configuration files, I was able to run the software stably. I found a power supply that would meet the power requirements for the Raspberry Pi and Electronics Explorer Board, with some overhead. In the future I hope to upgrade to a bigger and higher resolution touchscreen (Full HD 1920x1080, and 10" - 12" diagonal). Integrate power supply into the case and add a battery for true portability.